A growing body of evidence suggests that your diet may have more to do with your mental health than conventional wisdom may have you believe. 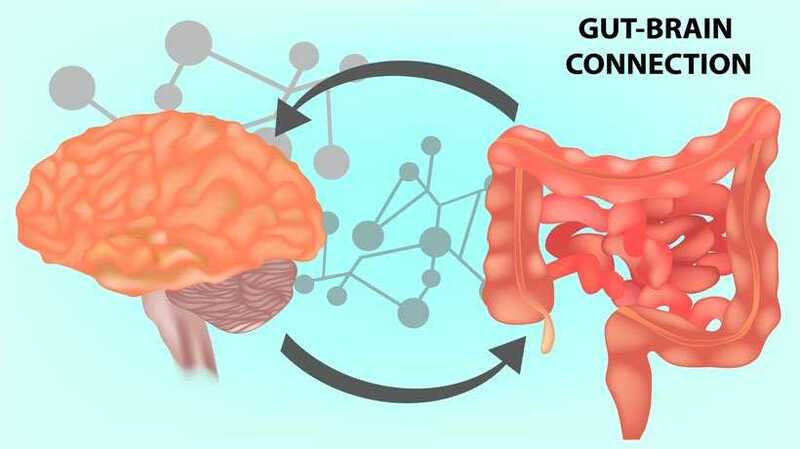 While most Americans would not be surprised to find that eating greasy food and drinking alcohol may lead one to feel sluggish or apathetic, few realize how extensive the communication between the brain and the gut happens to be. This communication does not solely concern unconscious bodily functions associated with the automatic nervous system, which is responsible for controlling things like heart rate, breathing, and digestion. There is far more going on. While scientists have known that the gut does far more than ring the proverbial dinner bell to let the brain know it’s hungry and extract nutrients from the food we eat, the idea that the digestive tract could seriously impact our conscious mind would have been considered absurd a few years ago. However, the human digestive system is far more complex than we were taught in high school biology class. On top of being populated by enzymes that break down food and villi in the small intestine that absorb it, the digestive tract is also lined with upwards of 100 million nerve cells that make up what is known as the enteric nervous system (ENS). The ENS then interacts with the 100 billion nerve cells in the central nervous system (CNS) through what is known as the gut-brain axis. Hearing that signals from the digestive tract can manifest in changes in behavior should come as no surprise. Anyone who has become increasingly agitated due to feelings of hunger (being “hangry”) has experienced this firsthand. However, what might come as a shock is that the digestive tract is home to billions of microbes—bacteria, fungi, viruses, and other microorganisms—that call our guts home. More importantly, these bacteria are not invaders or dangerous. They work in concert with the ENS to aid in digestion, to keep the automatic nervous system functioning normally, and to regulate our mood and sleep cycle. They have also been found to communicate through neural circuits in the CNS to affect cognitive functions and behaviors. New evidence even suggests that unhealthy gut biomes can lead to imbalances in individual’s brain chemistry, and that restoring the health of one’s gut biome can potentially reduce symptoms of depression and anxiety—two of the most common psychological disorders plaguing Americans. The ENS and the bacteria that reside in our gut biomes have so much influence over our mental wellbeing that many now consider the digestive tract to be our “second brain,” and the connection between the gut and brain to be more accurately denoted not as the gut-brain axis, but as the bacteria-gut-brain axis. Research into how the ENS and the CNS communicate is relatively new and a full understanding of the specific mechanisms that allow the two systems to share information is still years away, but studies have confirmed that many of the hormones and neurotransmitters that serve as the messengers between different parts of the brain come from the digestive tract. Colonies of bacteria in the ENS have been found to produce two of the most versatile and abundant neurotransmitters in the brain, glutamate and γ-aminobutyric acid (GABA). Research has also found that large quantities of melatonin, which is known to help regulate circadian rhythms, are created in and help regulate the gastrointestinal tract. Even the vast majority (upwards of 90%) of serotonin, which manages everything from behavior to body temperature, is synthesized in the intestine. Its production is regulated by gut bacteria. 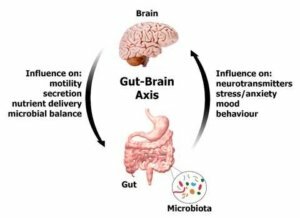 In fact, even the permeability of what is known as the blood brain barrier, which filters out foreign or potentially harmful substances from the blood before it is allowed to circulate into the brain, is regulated by the gut microbiome. More than just demonstrating that gut bacteria can affect the messengers running between the ENS and the CNS, these studies indicate that there is a strong correlation between unhealthy gut biomes and problems that were once thought to be localized entirely in the brain. They also reveal the importance of using a holistic approach to medicine that acknowledges how the numerous systems within the body are all reliant upon one another. The Integrative Center for Wellness keeps in mind how vital it is look at the human body in its totality while exploring treatment options for a wealth of disorders that often overlap. 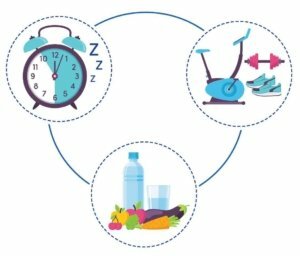 For example, sleep disturbances, depression, and obesity may at first glance seem to be three different problems stemming from three different sources. However, a closer examination may find that the three are merely symptoms of a single underlying issue. Rather than treating each problem individually, the holistic approach practiced by Dr. Samoon Ahmad of the Integrative Center for Wellness examines possible treatment modalities that both include and transcend traditional Western methods. While pharmaceuticals and therapy are certainly helpful in ameliorating symptoms, changes to patients’ diets, exercise routines, and lifestyle choices have also proven to be effective treatment options, as well. These changes have been shown to have several beneficial effects to one’s wellbeing, but, more pertinently, they can improve the health of one’s gut bacteria and, as indicated by the studies described above, this can have a major impact on one’s mental health. 0 Comments on "The Gut/Brain Connection and Your Mental Health"